I picked up a new 22 pistol last week and today was my first opportunity to see how it shoots. I've been looking for a semi-auto 22 LR pistol for general purpose plinking and to carry on casual walks around the property (No man eaters here!). 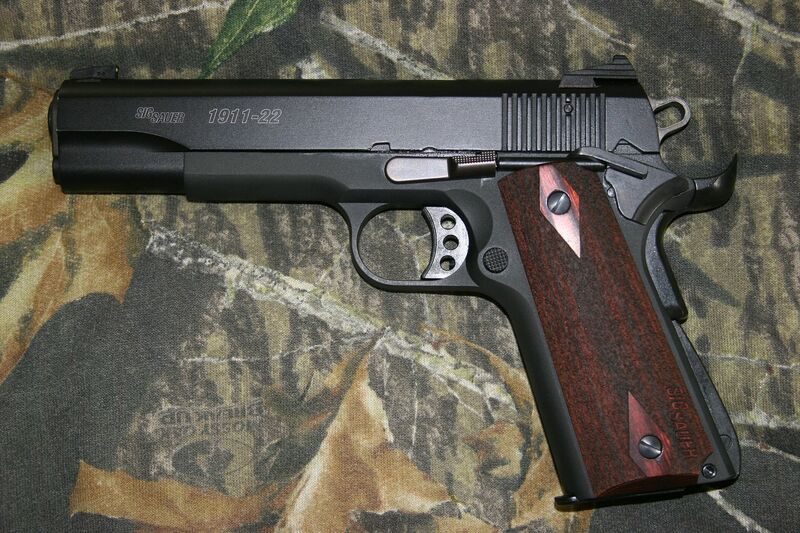 I have a Ruger Mark II that I really enjoy but decided to go for one of the options on the 1911 platform. I looked at buying a conversion for one of my 45s but decided I would rather just pick up a dedicated pistol. 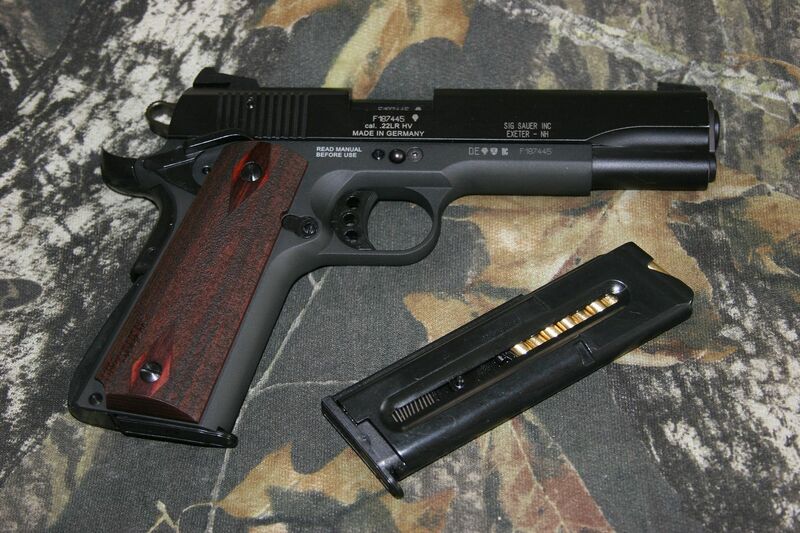 After looking around a bit, I decided on the SIG Sauer 1911 22. These are made by German Sport Guns (GSG) and branded for SIG and a few others as well as offered as GSG 1911 22s. The GSG branded guns are priced a bit lower but the local shop I was in didn't have one in stock so we worked out a deal we could both live with. There are quite a few videos out there on Youtube regarding this pistol as they seem to be fairly popular in the various shooting competitions. After reading the owners manual , I pulled mine down and gave it a good cleaning and inspection, lubricated it and reassembled it. The pistol came with only one 10 round magazine but I found a second locally. I fired 50 rounds of CCI Mini-Mag, 22 LR HP 36gr through it this morning. There were no failures of any kind for all fifty rounds. The front and rear sights that come with the pistol are plastic with an allen screw to secure them in the dovetails. I understand the dovetails are the Novak cut dovetail in terms of sizing. The sights are not the best, but they are serviceable until I can replace them. Three different front sight inserts are included in the parts kit along with a set of three allen wrenches for the various adjustments on the pistol. My pistol came with the tallest of the three front sights installed. From a bit of reading that I did beforehand, I decided to change the front to the middle height insert provided. Reportedly, that would provide a zero at 25 yards. Shooting initially at 10 yards, my first two 5 shot groups were about 2" high and 2" left. A slight adjustment to the front sight brought the third 5 shot group about and inch to the right and a small adjustment to the rear sight brought the fourth 5 shot group right on center R/L. I moved the target out to 25 yards and fired 4 more five shot groups and was able to put all but a couple of fliers into a 3" circle from a standing position, single handed. Elevation was pretty much right on as expected with a slightly low tendency. As I gain some experience with this trigger I would expect this to improve a bit. When I get the new sights, I will shoot off a bag to set things up. The last ten shots were fired as fast as I could pull the trigger just looking to see how the pistol cycled without worrying much about accuracy. To my surprise it was flawless and I can tell it will burn up ammo if you let it! The slide locks back after the last round. The magazines are metal and well made. There is a magazine safety feature that prevents you from pulling the trigger to lower the hammer unless there is a magazine in the gun. That feature will take some getting used to. There appear to be quite a few after market options for this pistol. For example, there are replacement followers and end caps for the magazines that up the capacity from 10 to 15. There are also replacement guide rods, barrel bushings, etc. For now, I'll shoot it as is, but I plan to replace the stock sight set with a set of metal components. One feature not terribly important for me but others may be interested in is the threaded barrel. The front of the barrel is threaded and comes with a threaded barrel cap, standard. A number of the articles I reviewed showed the addition of a suppressor and (other) add-ons. Several of the articles suggested that many standard 1911 parts will fit this pistol but I have not explored that avenue. The trigger on my pistol measured a 5.5 lb pull using a friends gauge. It is not a bad trigger but does have some creep. I'll withhold judgement until I have fired a few hundred rounds through the gun. Anyway, I'm pleased with the new addition. It shoots well and feels great in the hand. Time to go shoot a few more boxes through it! Last edited by TallGrass; 01-13-2013 at 02:08 PM. dhansen, lee barner, pokey and 1 others like this. Nice looking .22, Thanks for sharing the photos and the review. Post some target photos and update the thread if you put aftermarket sights on it. Tim I appreciate the link to your thread, somehow I didn't pick that one up when I did a search. Are you still using the original sights that came with your gun and if so which insert did you settle on? TallGrass, I also have a Sig 1911-22 that I got back in summer & it has become my most go-to firearm for plinking & pure fun. Have not had any problems with it & it just keeps shootin & shootin. Sometimes when I'm out in my reloading shed (mancave or doghouse ) I just stop what I'm doing, sit on the steps & empty a few mags just to ease the stress level. & You're right, the Sig will eat a lot of ammo if you're not careful cause they're so much fun. As for the sights, when I first shot mine seemeed as tho my groups were low, so I installed the mid-height front sight, but when I put the pistol on sandbags & 10yd. targets, then my groups were high, so I went back to the factory installed front sight. As I'm shootin it more & more I think (OH BOY) I've got it close enough for my needs. Any way, IMHO you made a good, & hope you enjoy it for many many years. Good Shootin to Ya. I looked at exactly that same gun today and a gsg branded one that had a flash hider on it to look like a suppressor but it was nothing but decoration. I am torn between one of those or a browning 1911 22 compact that my wife would actually be able to shoot but its a 200$ price increase. Thanks for that link Roe. I had not picked that one up. My search skills clearly need work but I'll get to that after I do some more plinking . Thanks for putting together your write-up in that thread. So far I am very pleased with the gun. No misfires, FTF. FTE or any problem in 300+ rounds fired. Yes, still have the original sights. Really should look into a narrower front, though. Getting used to it for plinking as is. Those orange self-sealing blocks and balls are a blast! BTW, we've probably put some 2000 rounds thru it by now. The only jams lately are occurring on very cold days (I'm in MN) when we're wearing thick gloves, so it may just need a firmer grip. I really enjoy this one - it's a lotta' gun for the money! Shot my PT 1911 Xmas day! Yippie Yi Yea!!!!! Picked up my PT 1911 today!